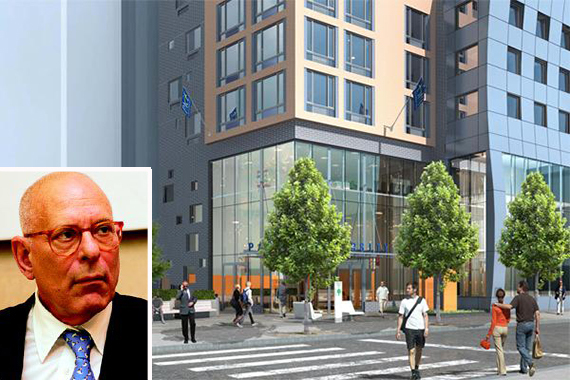 Pace University bought an interest in its new Downtown dormitory in October from SL Green Realty and the Naftali Group, but the lion’s share went to Rami Ungar, head of Israeli shipping firm Ray Car Carriers. Ungar paid $158 million for an undisclosed stake in the ground lease for the 772-bed, 179,000-square-foot dormitory building, completed last year, according to city records made public today. Pace, whose students will live in the dorm, paid $38 million for its stake in the building, records show. SL Green, the city’s largest office landlord, and Naftali bought a 51 percent fee interest in the property in 2012 from Massachusetts-based Jiten Hotel Management. Harel Insurance and Finance, based in Israel, which also partnered with SL Green on its first dorm project for Pace, at 182 Broadway, joined as an investment partner with a 41 percent interest. The property had previously been owned by Sam Chang’s McSam Hotel Group, which had planned to build a 36-story hotel on the site. Chang sold the distressed property in 2011 for $15.7 million, having bought it for $22 million in 2007. SL Green declined to comment and Naftali and Ray Car Carriers didn’t return requests for comment.